This is the best flaring tool for the money we have found. It has a feed screw with a hardened flaring cone eccentrically mounted in needle bearings which produces a rolling action for even metal flow. This provides uniform wall thickness without galling. It will put a 37 degree flare in 3/16”, 1/4”, 5/16”, 3/8”, ½”, 5/8” and 3/4” tubing. We recommend this tool when flaring 3/16” stainless steel brake line. Provides smooth, uniform flares with minimum effortFeed screw handle requires less motion and effort than standard handleFlares steel, stainless steel, hard copper and brass thru wall thickness of .035"Instructions (PDF)Learn more about flaring lines for our automotive fittings by reading our tech article. The Principles of Automotive Fittings. 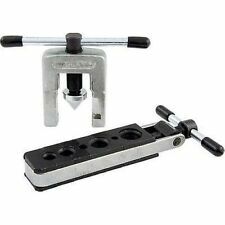 Item DetailsWe recommend this tool when flaring 3/16" stainless steel line. This -AN fitting flare tool is essential when working with 37 degree flared fittings. Tool for use with soft copper, aluminum and brass tubing will precisely flare from -3AN to -10AN and 3/16" to 5/8".. This is the tool you need to make the 37° flares required for AN fittings. Standard brake and fuel lines are flared at 45° which are not compatible with AN hardware. This tool forms stronger flares assured by a smooth, even radius formed at base of every flare with its precision machined chamfer. 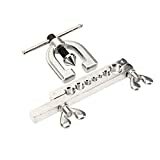 Plus, its also self gauging - just insert tube flush with top of die for accurate flare size.Hardened steel, chrome-finished cone makes exceptionally smooth, high-strength flares with a radius at base offlare – instead of the sharp angle formed by ordinary toolsSlip-on yoke permits use in tight quartersAllows flaring where there is little space between nut and tube endFeed screw design provides smooth, easier operationPositive gripping and self-gauging of tube for exact flare sizeSliding die blocks lock in place by clamp actionWorks on 3/16", 1/4", 5/16", 3/8", 1/2" and 5/8" OD tubing such as aluminum, copper, brass and mild steel. 910-89528 Instructions (PDF)Learn more about flaring lines for our automotive fittings by reading our tech article. The Principles of Automotive Fittings. Item DetailsMade in the U.S.A. Creates the proper angle for AN and JIC fittings. 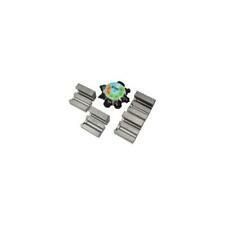 Set includes flaring bar and yoke with center screw. 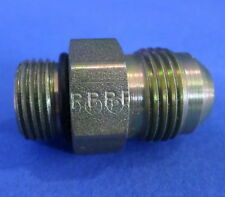 Fits tubing sizes: 3/16, 1/4, 5/16, 3/8 and 1/2-Inch O.D.. Floating cone for accurate alignment. For high performance applications only. Creates the proper angle for AN and JIC fittings. Set includes flaring bar and yoke with center screw. Fits tubing sizes: 3/16, 1/4, 5/16, 3/8 and 1/2-Inch O.D. Floating cone for accurate alignment. For high performance applications only. Provides smooth, uniform flares with minimum effort. Features a ratcheting feed screw that has a hardened flaring cone supported by needle bearings. Will put a 37-degree flare in 3/16", 1/4", 3/8", 1/2", 5/8" and 3/4" tubing. Works great flaring 3/16" stainless steel brake line. Flares steel, stainless steel, hard copper and brass thru wall thickness of .035". This is the best flaring tool for the money we have found. It has a feed screw with a hardened flaring cone eccentrically mounted in needle bearings which produces a rolling action for even metal flow. This provides uniform wall thickness without galling. It will put a 37 degree flare in 3/16", 1/4", 5/16", 3/8", ½", 5/8" and 3/4" tubing. We recommend this tool when flaring 3/16" stainless steel brake line. Provides smooth, uniform flares with minimum effortFeed screw handle requires less motion and effort than standard handleFlares steel, stainless steel, hard copper and brass thru wall thickness of .035"Instructions (PDF)Learn more about flaring lines for our automotive fittings by reading our tech article. The Principles of Automotive Fittings. Item DetailsWe recommend this tool when flaring 3/16" stainless steel line. This is the tool you need to make ONLY 37° flares required for AN fittings. 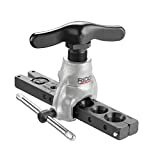 This tool will NOT make 45° flares for standard brake and fuel lines which are not compatible with AN hardware. This tool makes a clean, accurate 37° flare every time. Simple and easy to use.Necessary for making ONLY 37° flares for AN fittingsWill NOT make 45° flares for standard brake and fuel lines that are NOT compatible with AN hardwareMakes a clean, accurate flare every timeSimple and easy to useWorks on tubing from 3/16" to 5/8"Not recommended for use on stainless steel This item is replacement for sku# 91089529Works on 3/16", 1/4", 5/16", 3/8", 1/2" and 5/8" OD soft metal tubing such as aluminum, copper and mild steel.Note: If flaring stainless steel line, we strongly recommend our ratcheting flaring tool 910-89524. Learn more about flaring lines for our automotive fittings by reading our tech article. The Principles of Automotive Fittings. Notes Brake System Builder's Tip (Link) The manufacturer recommends using this tool only on soft material lines. However, we have had good luck using it on 3/16" steel lines. Extensive use on 3/16" lines or on larger steel lines may result in wearing out the tool quicker. We recommend using a lubricant on the swedge. Deluxe tool 910-89528 is recommended when working with steel tubing exclusively.If flaring stainless steel line, we strongly recommend our ratcheting flaring tool 910-89524. Item Details Not recommended for use on stainless steel tubing. 37 Degree Rol-Air Flaring Tool For 3/16", 1/4", 5/16", 3/8", 1/2" and 5/8" Outer Diameter Tubing For use with soft copper, aluminum and brass tubing. Faceted, hard chrome-finished cone rolls out perfect 37° flares above die block - then automatically burnishes flare face. Original wall thickness is maintained at base of flare. New slip-on yoke permits use in tight quarters where there is little space between nut and tube end. Larger handle, with better leverage, and precision threads on feed screw make flaring effortless. Heat treated dies firmly grip tubing. Satin chrome and black finish. Weight: 1.75 lbs. 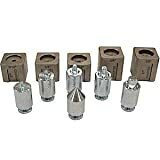 37 Degree Heavy-Duty Flaring Tool For 1/8", 3/16", 1/4", 5/16", 3/8" and 1/2" Outer Diameter Tubing Forms 37° flares in annealed stainless steel (MIL-T-6345 or AMS5566), cold drawn stainless steel and annealed copper or aluminum tubing. Built to withstand continuous rugged service. Ball thrust bearing mechanism reduces effort required. Hardened tool steel die features non-slip grip of tubing, even after repetitive flaring. Bar has vise extension. Weight: 3.25 lbs. 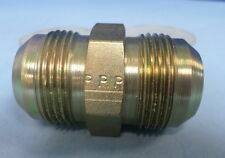 Double Flare Adapters: 3/16, 1/4, 5/16, 3/8 and 1/2". Use with 71201 Hydraulic pump. 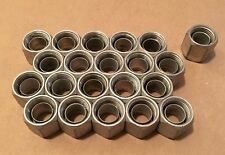 Dies: 3/16, 1/4, 5/16, 3/8 and 1/2". 45 Degree Flaring Tool, 3/16 In. To 5/8 In. Makes clean, accurate 37 degree single flares every time. Perfect for brake lines or fuel lines. Works on 3/16", 1/4", 5/16", 3/8", 1/2", and 5/8" OD tubing. For soft metal tubing such as aluminum, copper, and mild steel. Not recommended for use on Stainless Steel. Hardened and polished flare cone: High quality flare sealing surface. Multi block multi-clamping calipers: Firm, quick, off-center clamping of the tube and automatic self-centering tubes don't slip. Mold available in metric and English measurements. Special screw thread: Allows smooth, efficient deformation of material. Made from high quality steel: Long-lasting. 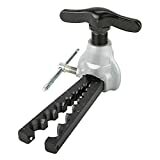 The Rothenberger 26032 RoFlare 37-Degrees Single Compact Flaring Tool, 3/16 to 5/8-inch, includes RoFlare basic tool with multiblock. 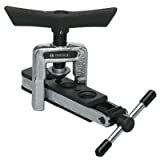 Compact Flaring Tool, foldable For producing precision 45-degrees single flares on copper, brass, aluminum and precision steel tubes up to 0.04-inch (1 mm) in wall thickness. Ideal for mobile applications and for pipes in refrigeration and automotive (brakes) industries. Double and 180-degrees flares are also possible with the RoFlare double flare attachment. Overall dimensions: 3/16-inch, 1/4-inch, 5/16-inch, 3/8-inch, 1/2-inch, 5/8-inch. Established in 1949, Rothenberger has over 50 years of history as the market leader of innovative and technologically sophisticated pipe tools and machines. A long list of patents, Certification in ISO 9000, 9001 and 9002 and an emphasis in research and development result in continuous improvement and new developments in professional pipe tool technology.